These just need the ends darned in and a press. I really like these although they have two fingers in a third colour. I have decided this is a design feature so I’m hoping that the recipient thinks so too. I knew that the second colour, the pinky mauve was going to be tight but I thought I’d get more out of it than I have done. I’ve still got two fingers to do on each hand but I have got some similar colour yarn from Marion Foale which I’m hoping will look ok.
I’m also very torn about breaking the two colour rule although if it ‘s because I’m out of yarn then that seems ok. 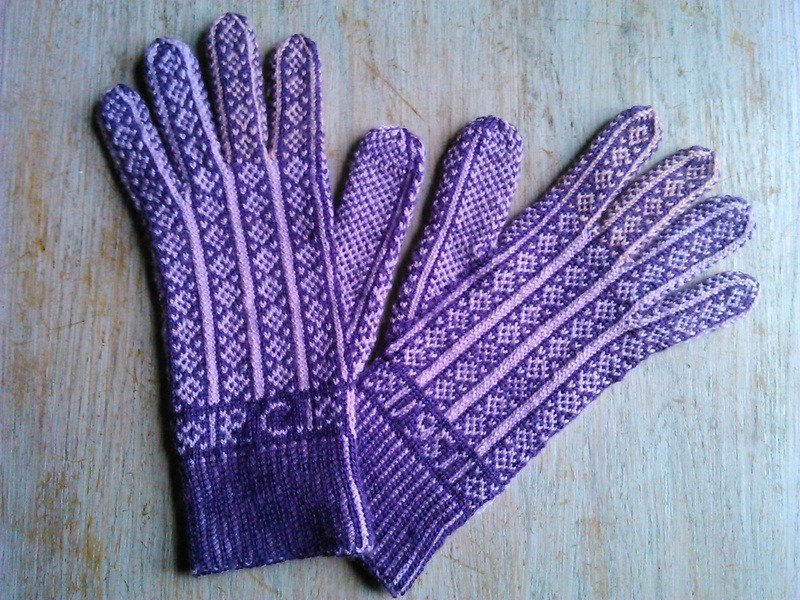 I decided that I didn’t like the Sir Gar gloves that used lots of colours – using only two colours is a real discipline. 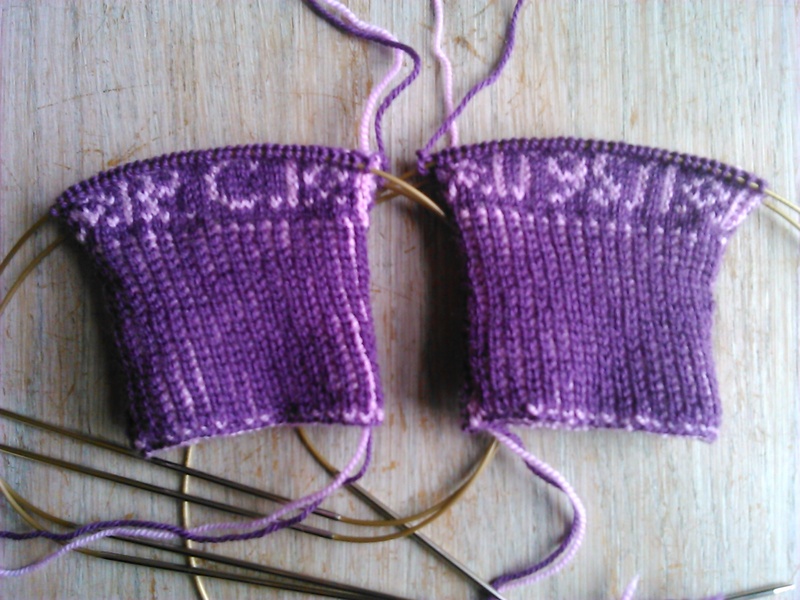 Actually I’m up to the little fingers now as I was able to do some knitting in the car after the walk yesterday. 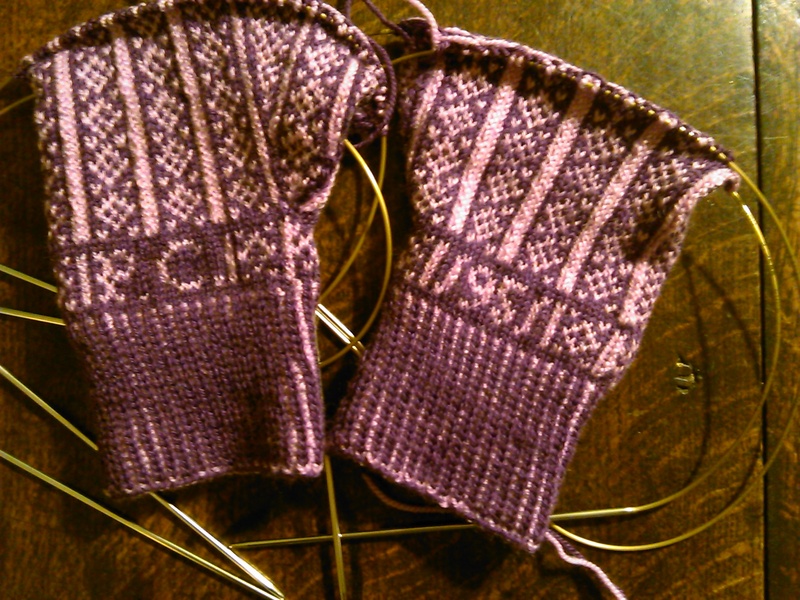 I’ve set myself a schedule for these gloves – I want to knit three pairs before I go away in April … so I need to keep going. I’m supposed to be half way up both thumbs today and I’m not far off. I’m also keeping a fairly accurate log of the time these are taking. What is surprising me is the time it takes to plan out the charts and to set the patterns. I was a stitch out on the second pair this afternoon and it must have taken half an hour to sort it, hence the nasty plastic stitch markers in the photo below. I prefer to use thread but hard markers can be useful now and again. These have a small sharp bit on the top that needs to be sanded off with an emery board or it catches on the wool. I did a quiz earlier to find out what kind of yarn I would be – I’m Rowan Big Wool! It’s on line at Love knitting and was posted in the Knitting and Crochet Guild Facebook page. The ribs and initials and dates on a pair for a friend. Marion Foale 3 ply and vintage 3 ply, both pure wool. 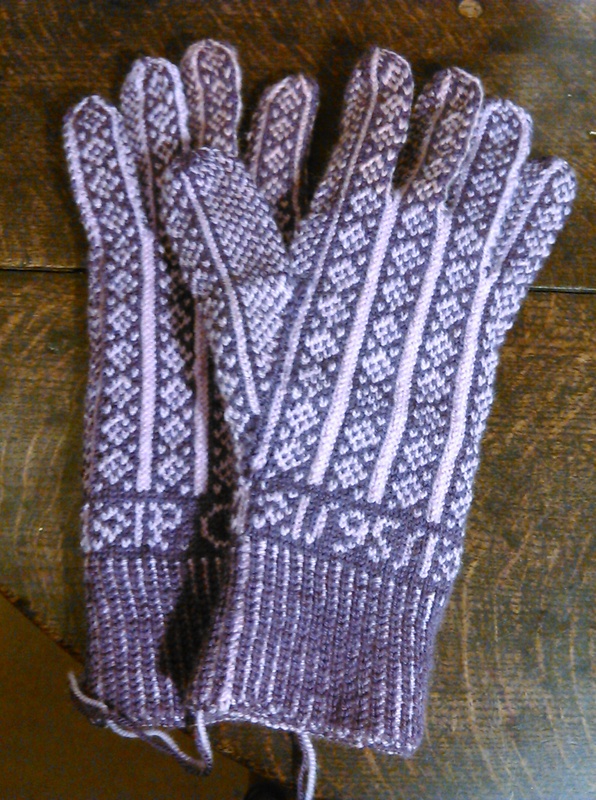 Patterns are from Yorkshire gloves.